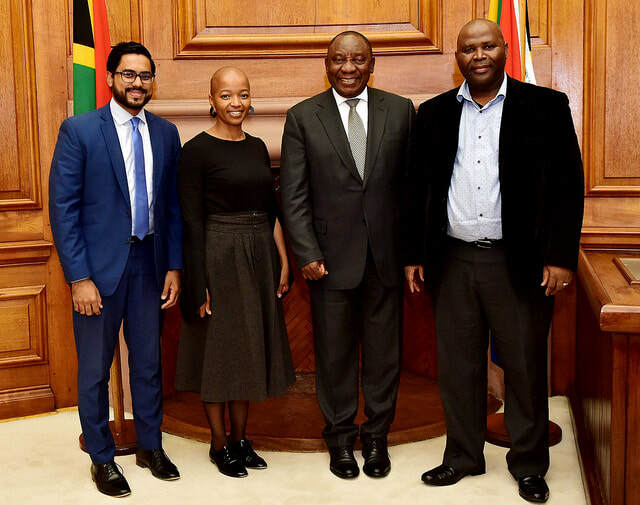 YaleSA Advisory Board Member and Director of Futures Academy recently met with President Cyril Ramaphosa on 13 June 2018 to brief the President on Scenarios 2030. The president has been briefed by Mr Uwais Razack, Ms Xolelwa Kashe-Katiya, and Dr Somadoda Fikeni on the Indlulamithi South African Scenarios towards 2030, which considers the economy, work and society, environmental justice, reconciliation and redress and crime and safety. 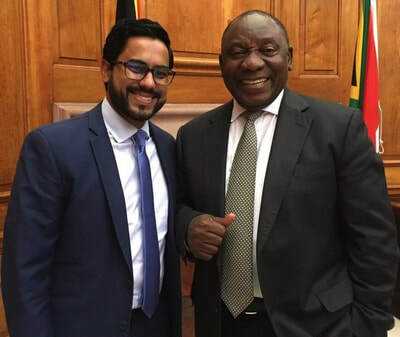 The project is a response to the reality that, despite great progress over the past two decades, South Africa still faces major challenges. As a nation we are struggling to deal with a confluence of inadequate economic growth, widespread unemployment, sharp inequalities, low levels of fixed investment and frail social capital. Cumulatively, these have a major impact on the living standards, safety, education and health of our people. Indlulamithi is devoted to helping South Africans realise a common purpose and shared vision that focuses on appreciation of our diversity and on solidarity as a means to development and progress. The project is led by Dr Somadoda Fikeni and is supported by a group of diverse stakeholders from government, labour, civil society and business. YaleSA moved its operations from Imam Haron Road to 63 St Johns Road, Lansdowne. YaleSA took occupation on 8 January 2018 and subsequently embarked on a refurbishment project on the campus. This involved painting, sanding and coating of floors and cosmetic improvements that were concluded on 23 January 2018 in time for the orientation and opening on 24 January 2018. The new campus features 5 classrooms, staffroom, administrative offices, kitchen, multipurpose hall, garden, community tennis courts and the public park. 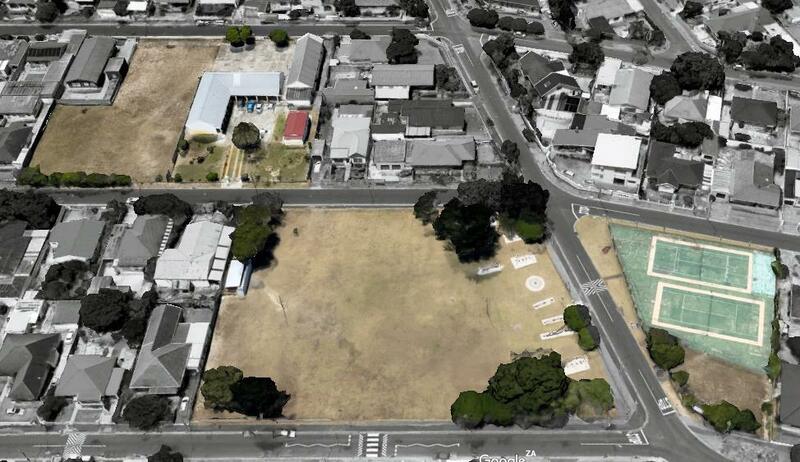 Here's an aerial view of our new premises. Imaad Isaacs, Director of YaleSA, was selected as a delegate at the 2017 Brightest Young Minds Summit in Sandton, Johannesburg. The summit spanned six full days of problem-solving and innovation with 100 young leaders from across the African continent. Participants engaged in topical issues including leadership, food security, digital technology and education amongst others. "The African continent is in good hands. It is humbling to see the local talent this continent has to offer in preparing Africa for the future that is already here." Aimed at giving participants a solid appreciation for the grammatical and morphological composition of the Arabic Language. We will pay particular attention to grammar rules, morphological scales, reading, writing and oral presentation with extensive vocab lists and situational practice. Ages 15+ are welcomed to apply. 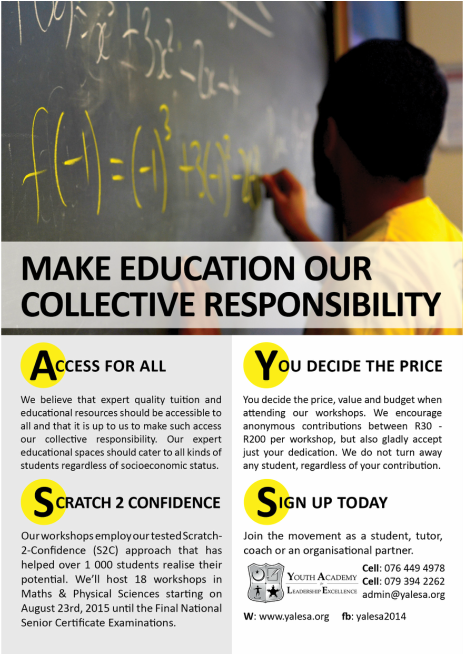 Classes are small, intimate and taught by Imaad Isaacs with additional tutorial hosted by tutors. Imaad Isaacs and other tutors will be hosting the above course during the summer vacation period. Proceeds will be used for partial funding to continue a Master's in Business Leadership (MBL) degree. YaleSA students recently visited Peninsula Beverages. PB is the local franchisee of Coca Cola responsible for the distribution of Coca Cola brands in the Western and Northern Cape, South Africa. Learners gained insights into the manufacturing and bottling processes of Coca Cola, including quality control, distribution, marketing, sales and the Company's social footprint in South Africa. Our learners also enjoyed free Coke and received some branded notebooks and diaries. On Wednesday 21 September 2016, YaleSA FTA boys went on an excursion to hike Constantia Nek. The aim of the excursion was to explore and appreciate the Fynbos Biome, of which some species are indigenous to the Western Cape. Students were accompanied by a SanParks Ranger, who pointed out the iconic Protea, Erica and Restio families amongst others. They were given the opportunity to touch, feel, and enquire about these plants and their importance to the environment. ​The boys informed us that they experienced much fun and contentment-becoming one with nature. They also took Wudu (ritualistic cleaning prior to prayer) using the naturally occurring mountain streams. Thereafter we prayed on the grass – how peaceful that was! Matric Rewrite Program now open! 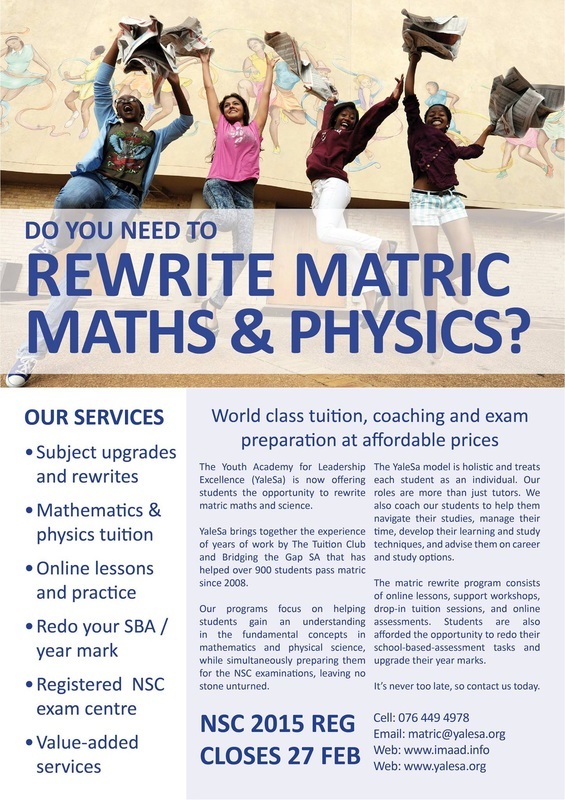 YaleSA offers students a flexible opportunity to either redo maths & physics, or even upgrade from mathematical literacy to mathematics. After registration a service agreement will be generated and emailed to you. Please read the document before the first class where a digital copy will be made available to sign.